We’re all creative people here on the Know Direction Network, and occasionally we get excited and share those creations with you. When we do, to make them easier to find for everyone, we’ll post them here. 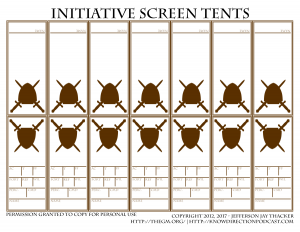 First discussed in Know Direction 42, these screen tents are an easy way to track initiative that both you and your players can see! Simply right the name on both sides, and hang them in order on the GM screen of your choice. With four different colors to choose, you can easily tell who’s a PC, Friendly NPC, Enemy, or Bystander at a glance. And the GM can record frequently needed stats on his side. In Know Direction Pathfinder Podcast episode 62, we discussed how to make low level monsters a higher level challenge. Specifically gave the example of how I wanted to make Goblins a challenging fight for a 5th level party. I also wanted to preserve their unique ‘gobliness’ that Pathfinder has given them, to not just feel like another stat-block or NPC. Included here are the goblins I discussed in that episode, ready for play, and a brief description of their tactics. I actually came looking for the snowflake cards, because we were thinking of making some for our Skull and Shackles and Iron Gods games….